Silly Bee's Chickadees: IPA Mega Giveaway! 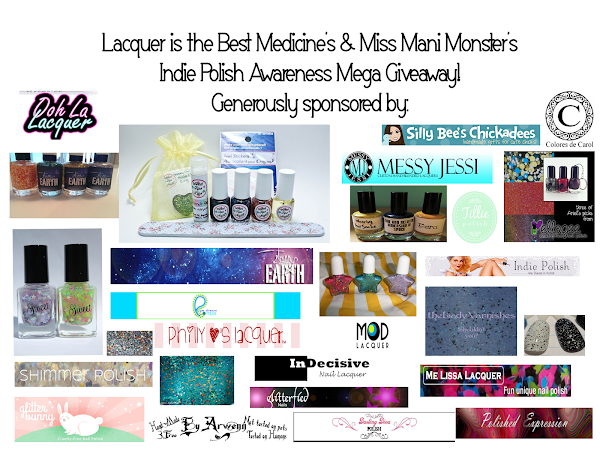 Lacquer: The Best Medicine and Miss Mani Monster have joined forces to promote indie polish awareness by hosting a huge giveaway! About a month ago, I saw a post from Cassandra of Sweet Heart Polish on her Facebook Page asking if any bloggers would be interested in hosting a giveaway for her nail polish. I have used several of her polishes, and I absolutely adore them; so, of course I jumped at the opportunity! I figured it would just be a simple 1-prize giveaway as usual, but then we got to talking - she said that if anybody else wanted to participate that would be fine. I told my good friend Heather over at Miss Mani Monster about this, and we got talking about indie polish brands and how there are so many wonderful ones out there that don't get enough attention - and usually it's just because people don't know they exist! Heather and I are SERIOUS fans of indie polishes, which is pretty obvious if you browse through our blog posts! So, we thought it would be a great idea to help promote indie polish awareness - and what better way to do that than by giving away some of the actual polish!? Heather and I believe that direct interactions between seller and customer is the best way to spread the word about a brand - so that is exactly what we are doing! Well, enough of my yapping; lets get to the good stuff! The giveaway is separated into two separate parts - US only and International. The first Rafflecopter widget you'll see is the US only widget; please make sure you only enter that one if you're from the US! (or if you have a friend in the US we can mail it to) ... The second widget is for all my lovely international ladies (and gents, maybe) out there. Here is a quick peek at some of the prizes you can win, along with all the wonderful indie sponsors!